When you need equipment and materials for an asphalt construction project, who do you choose to rely on? Unreliable transportation companies can cause your project to grind to a halt, costing you time and money as jobs drag past their expected end date. You need a company with the resources to handle asphalt transportation services in a timely, reliable manner. 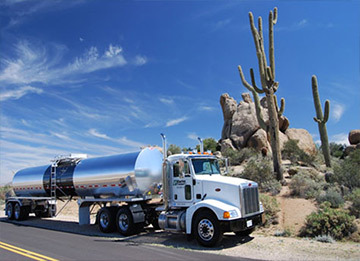 You need Cactus Transport, the logistics arm of Cactus Asphalt in Phoenix, AZ. Cactus Asphalt is a family-owned business with over 30 years of experience in the State of Arizona and the State of New Mexico. We are the largest asphalt transportation company in the southwest and we transport over 300,000 tons of asphalt annually. For years, we’ve supported communities in Phoenix, AZ, and beyond with high-quality asphalt paving and construction services. We now also dedicate our time-tested resources, equipment, and know-how to assisting other asphalt companies complete their work. For more information on how Cactus Transport can help you with our industry-leading asphalt transportation equipment and delivery services, call today. With over 30 years experience in the region Cactus Transport in Tolleson, AZ has the right solution to all your asphalt trucking needs. Our headquarters are housed in Arizona along with our diverse fleet of equipment. This region is the base of operations for our Asphalt Rubber Blending operating; computer rate controlled spreader truck fleet, as well as our fleet of dump trucks. It also houses one of the largest regional fleets devoted solely to liquid asphalt transportation. With almost 10 years experience in this region, Cactus Transport is well equipped to deal with the changing needs of this market. Our knowledge and ability to providing an exceptional level of customer service is what sets us apart from our completion. It is also home to our CT logistics fleet, which is responsible for moving products such as bleach and liquid oxygen. We use heavy-duty, reliable fleets of tanker trucks to transport liquid asphalt, emulsions, and other raw or liquid materials needed for jobs of any size. We dispatch deliveries at all hours of the day and maintain our trucks so that you can always have reliable service. Our knowledgeable team knows exactly how to handle specialized equipment and materials for timely and safe deliveries. Our heavy haul transport service delivers needed equipment to your worksite at a moment’s notice. As experts in the asphalt industry, we realize that having your equipment present and accounted for right when you need it is an absolute must. With Cactus Transport, we make sure that you never have to worry. We offer spreader trucks for jobs of varying sizes and material needs. Our spreader trucks are always kept in peak condition so that you never have to worry about getting a truck that isn’t ready to handle the toughest job. When your job needs asphalt or aggregate poured, our dump truck operators take care of the job with unmatched expertise. With decades of asphalt construction experience, we can deliver a dump truck full of your desired raw material to a site and use our knowledge to assist in the pouring. Our subsidiary CT Logistics LLC is dedicated to helping clients safely transport hazardous materials. Our expert drivers operate a fleet of secure tankers that get you what you need, when you need it, even when what you need requires special handling and safety precautions. CT Logistics LLC specializes in compressed gases, including but not limited to hydrogen, helium, nitrogen and oxygen, LP gases, sodium hypochlorite, and liquid asphalt petroleum products. For an asphalt construction transport company you can trust, contact Cactus Transport by Cactus Asphalt in Phoenix, AZ.